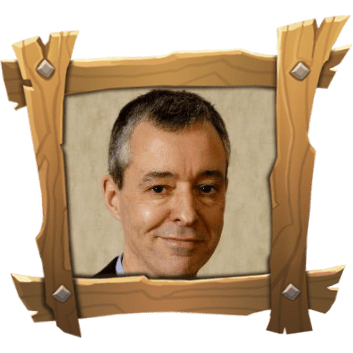 Richard Breese was probably the person who invented worker placement as a mechanic and has created many fantastic games including the new favourite in my group, Inhabit The Earth. And he co-designed my personal favourite game Keyflower. One of the absolute top-level designers in my book. We asked him to do a designer spotlight, he agreed, and I am personally thrilled about it. So here it is. My background is in finance and my day job is Finance Director of a commercial property development company. I have three great sons who used to help with the play testing of my games. I currently live in Stratford upon Avon, an attractive town in the English Midlands, famous for being the birthplace of William Shakespeare. I started designing games in the 1980’s and the formed R&D in 1989 with a view to publishing my own games. The first game I published was Chamelequin, which is an abstract game with an interesting movement system that had been simplified down from my D&D experiences. I promoted the game at the UK games trade fair where I met Ian Livingstone, founder of Games Workshop, who suggested I go to Essen, which I had not previously heard of. So I went to my first Spiel in 1991 and have been back each year since, sometimes as a gamer, but now usually with a stand. Having discovered German games I then decided to try to create my own. The first was Keywood, which was names after an American gamer Keywood Cheves, who I met at the Hans in Glück stand. The next game in the Key series was Keydom, which is widely regarded as the first worker placement game, which was subsequently reissued by Hans im Glück as Morgenland and in the US as Aladdin’s Dragons. All the Key games have similar qualities such as indirect player interaction, positive actions and a scale involving pieces representing workers (more recently called ‘keyples’) and, until 2016 (see below), set in the medieval landscape of the Keydom. The two games I have played the most of recently and which I enjoy as much as any are inevitably Keyflower and Inhabit the Earth. If you are developing a game you have to play it a lot of times to make sure everything works optimally and is in balance. So whist I enjoy playing other games I do not get to play them as often. At the moment the two recent games I have been playing the most of are Roll for the Galaxy: Ambition and Codenames. If they are prospective gamers I think the traditional gateway games of Settlers, Carcassonne and Ticket to Ride take some beating. If they are family gamers then I would suggest Love Letter, Codenames, Take It Easy, Rummikub and Ingenious for starters. Going to your first Essen Spiel always takes some beating. But then I enjoy the show each year as I’ve been fortunate that the R&D games have always been well received. It was very encouraging when Keyflower was voted the top game at Spiel in 2012 on the Fairplay listings. I enjoy board games because I enjoy the positive, face to face, interaction with other gamers. It’s often a challenge and a good shared experience. Because I enjoy it. There are several aspects. The designing and playtesting with my play testers, which feels creative and rewarding. The actual production. I do the graphics myself and until this year, used my sister Juliet’s illustrations. Then finally it’s fun to be at Spiel, to meet gamers and to demonstrate the new games. Your games are like your children, it is not something where you like to express a favourite. Obviously it is nice to create successful games and Keythedral, Reef Encounter and Keyflower all reached the BGG top 100 when they were released, which was pleasing. To be able to create a positive experience for gamers. I know what works for me in a game and reflect this in my designs. In particular indirect player interaction, positive actions, lots of choices and family friendly theme. It can be from either. In the key world the theme, until this year, has been largely fixed. With the other games such as Fowl Play, Inhabit the Earth and Reef Encounter, the theme was always present when the original mechanic came to mind. Only in The Boardgamegeek Game have I changed a theme and in that instance only marginally, when a shopping game became a specialised game of acquiring board games! I tend to be thinking about games much of the time. So the inspiration can come from day-to-day activities, from gaming generally, reading or, in the case of Reef Encounter, from watching David Attenborough’s BBC Blue Planet TV documentary series. Often playing games you can think of a different way of approaching a problem. 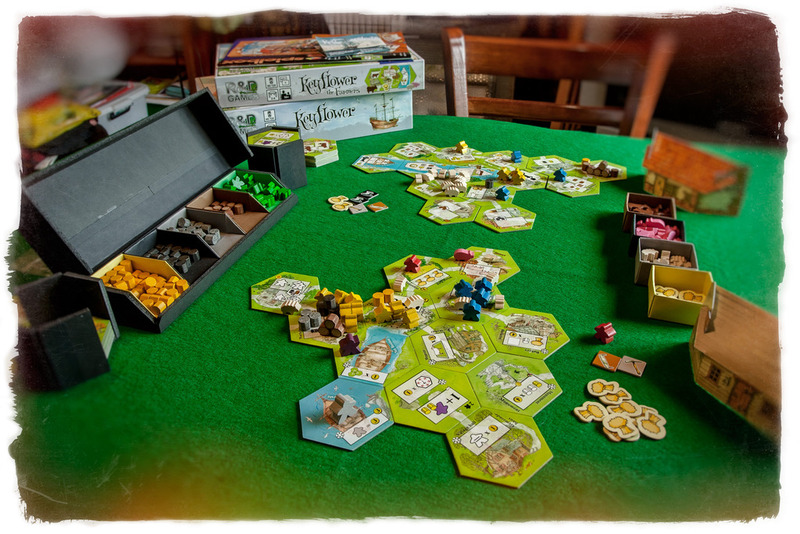 For example the worker placement idea in Keydom originated from playing Klaus Teuber’s seminal game Settlers of Catan. I enjoyed Settlers, but was not over fond of the luck factor inherent in the dice rolling. I wanted to achieve the same effect but without the dice, just by direct placement of the workers on the board. This became the central mechanic to the Keydom and the first worker placement game. Bonus question: How do you decide if a design is fit for a ‘key’ game or a stand-alone game? Until this year a Key game always had the characteristics partly mentioned above. The have all been worker placement games. There is no direct player interaction (with the exception of the first game in the series Keywood) – the interaction is through the game mechanism, the medieval theme is family friendly – no death or violence, activities are positive. So if all those features are present, then the game becomes a Key game. Last year’s game Inhabit the Earth was always a wildlife game. Partly due to the movement system based on the continents and terrains and partly because of the race and migration aspects. This year with Key to the City – London however I have made an exception. All the Key elements are present except that the setting of the game is in London, with each tile featuring a London landmark. But because of its similarities to Keyflower it seemed sensible to retain the Key prefix.